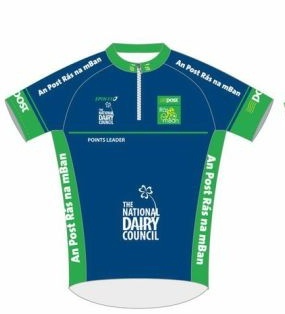 The National Dairy Council has announced this afternoon it will sponsor the points classification jersey for Ireland’s top international cycling race for women, the 2013 An Post Rás na mBan. After five years in Kerry, the race moves to a new base in Ennis, Co Clare in 2013 for the first time, from where it will take in six stages in five days from 11-15 September, 2013. The challenging and varied route involving more than 400 kilometres of racing, covers well-known destinations throughout County Clare including Lisdoonvarna and Ballyvaughan. The race features 16 categorised climbs dotted throughout the week’s itinerary. It has four tough road stages plus a team time trial on the morning of the third day, followed by a short circuit ‘criterium’ stage in Ennis town centre in the afternoon. The blue National Dairy Council Points Jersey will be worn by the rider who shows the most consistency in finishing in the top finishing positions and will be presented to the classification leader at the end of each of the six stages. It mirrors the Tour de France classification won four times by Ireland’s Sean Kelly and often favours riders with all round ability and a strong finishing sprint. The National Dairy Council promotes the nutritional credentials, quality and taste of Irish dairy produce to consumers. Zoë Kavanagh, Chief Executive of the NDC explains there has been growing interest from dietitians and athletes in the positive role that milk may play in a number of aspects of sports nutrition. “Research from Loughborough and Northumbria Universities respectively demonstrates the potential effectiveness of skimmed milk as a re-hydration drink after exercise; and the beneficial role milk and milk-based products may play in recovery from exercise-induced muscle damage,” said Kavanagh. There has been strong international interest in the 2013 An Post Rás na mBan, with teams from nine different countries already confirmed, from Europe and including two squads travelling from the United States. By way of example, The Ritte Women (known as the Ritte Chicks) from Los Angeles, bring a colourful attitude to their racing. “We race to win,” they say, but victory isn’t their only goal; their mission is “to spread the joy of cycling and win fans to the sport.” Overall and team champions Team Rytger from Denmark have also confirmed that they will return to Ireland in September to defend their titles. 2013 is the 27th anniversary of the start of international stage racing for women in Ireland, beginning with the John Hearn Memorial Women’s Three Day in 1986. The 2013 Rás na mBan is the eighth edition of the race. The Women’s Commission of Cycling Ireland took over promotion of Ireland’s leading women’s stage race with the creation of the two-day, Dublin-based Ras na mBan in 2006. The race expanded to three days and moved to Sneem, Co Kerry in 2008. It further expanded to a five day event in 2011, establishing its position on the international cycling calendar.